Hello my Friends. It's definitely been a week. I know how hard it's been in the south with dual hurricane's and Hurricane Jose possibly on the way. Meanwhile, it seems as though with all of that news, the fires that are STILL raging here in the northwest and the millions of acres that have burned have been forgotten. People have lost homes, ranches, farms. Their way of making of living is gone in a puff of smoke! National monuments have burned to the ground and the fires still rage on. It's been a long, long time since I have heard anyone on the news shows, other than local news, mention these people. Lots of us know Teresa in Oregon. She and her family have been on an Evacuation Alert Level 2 for over a week. That means she has to be ready to leave her home and everything behind at a moments notice. This particular fire was all because a teenage boy decided to light fireworks in tinder dry, no burn conditions. What could lead him to take such a tragic route? We had a school shooting here yesterday. In the tiny town of Freeman, WA which is on the southern border of Spokane, a teenage boy shot and killed one boy who bravely tried to stop him and three girls who are hospitalized. The boy who was killed had lost his father in June in a tragic accident. His poor mother and sister. No reason for the shooting is known as of yet. Speculation runs rampant. What could lead him to take such a tragic route? An Eagle Scout in a friends boy scout troop committed suicide Tuesday night. He had everything going for him. A bright young man by all accounts. What could lead him to take such a tragic route? There is some good news. While nothing can be done now about the last two tragic events to change the course of events, snow and rain is forecast in Montana this weekend, although not in the Glacier Park area where one big fire is burning. We may get some rain next week for the first time in three months. We've broken all records this year for the amount of days over 90 degrees straight and also for no rain. We're all praying for downpours across Oregon, Idaho, Washington and Montana. Our world is going crazy at a rapid pace. My prayers go out to each and every person affected by the hurricanes, fires, shooting and deaths. My peace comes from God. The author of peace and love. I hope you can also turn to Him for comfort in these troubling times. Now, more cheerful things. 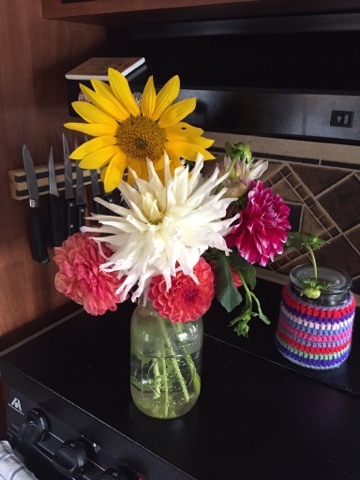 I was given two beautiful bouquets at the lake last Sunday. Aren't they beautiful? This one looks right at home with the vintage table cloth I found in a thrift store for a mere 50 cents a few years ago. It really helps to makes the trailer nice and homey. The smoke cleared a little bit for two days last weekend and it was beautiful, although you can still see a slight haze. This is what it looks like again today! Yuck! So, I've been busy knitting and praying for all of the situations that I have absolutely no control over. These were knitted with some Hobby Lobby "I Love This Cotton" that was given to me as a thank you for making the cell phone purses. I also made another cell phone purse with this yarn but gave it away without taking a photo. 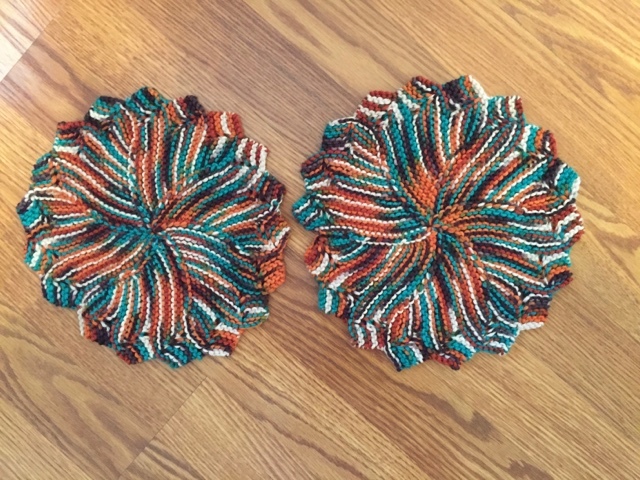 All three were made with just one skein! The end of a ball of Knit Picks Dishie Cotton that I had left over. 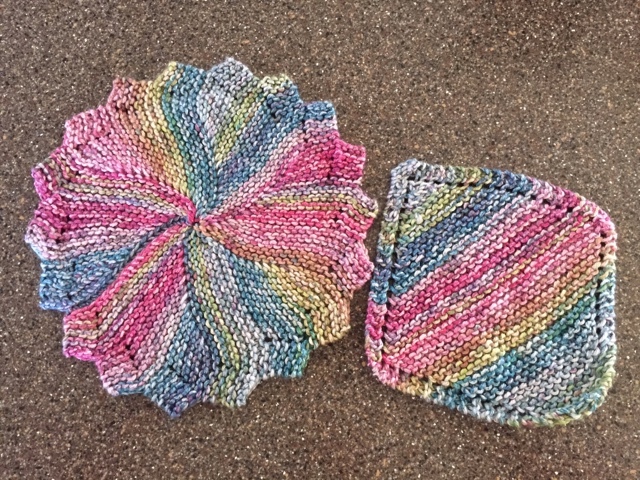 These two were also "I Love This Cotton" and I made a small square washcloth which was given away at the lake. All from one skein. This is quickly becoming my favorite cotton to knit with. It's so soft. 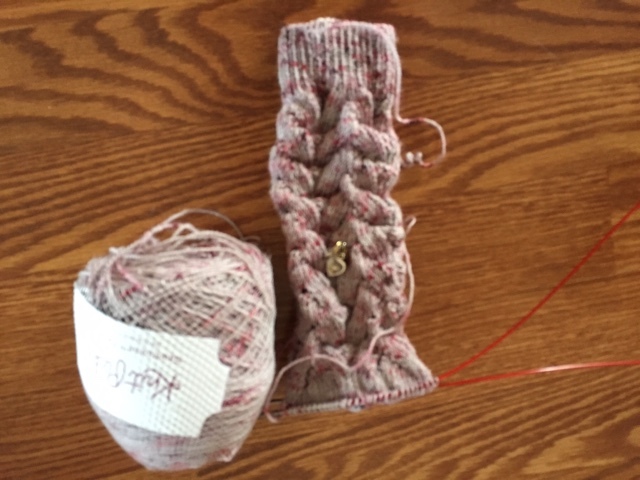 I have two pairs of socks on the needles. 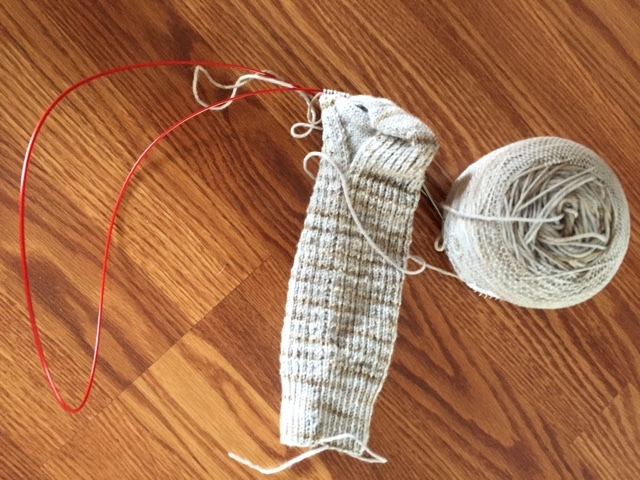 I think I have figured out the magic loop method of knitting socks which will be great for airplane knitting. I can't tell you how many dpn's I've lost from dropping them on an airplane! This is the "Petty Harbour" pattern. It's free on Ravelry. Knit Picks "Mocha" yarn. I have no idea why this is so blurry. 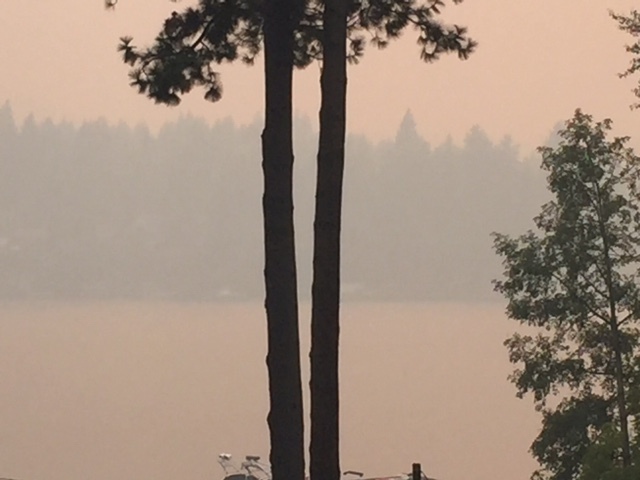 I know the light is bad on all of the photos because it's almost dark at noon from the smoke but the blurriness is all MY fault for some reason. :-) These are "Monkey Socks" which is free on Ravelry and Knit Picks yarn. I will leave these socks alone now and save them for knitting on the plane and at Mandy's house. I've turned the heel on both, so it should be mindless knitting and easy enough for travel along with being small enough to fit in my purse. 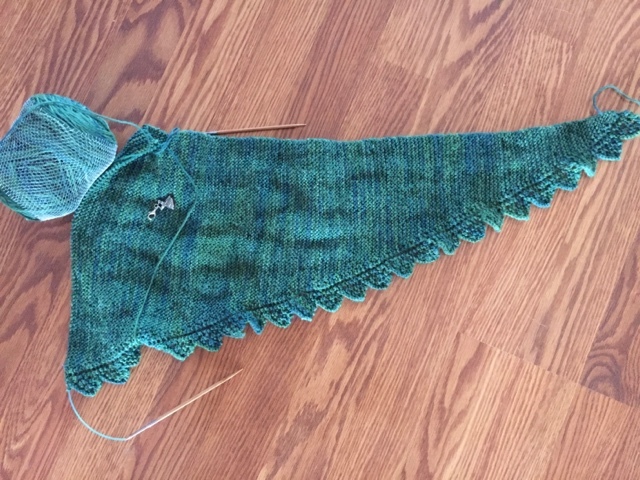 I have reached the halfway point on the "Pimpleisse" shawl and am beginning decreases. This might go to Mandy's too. I can't take much carry on with me because of the weight limitations for my back, so I'm trying to find small projects to take along. All of my clothes, etc. will have to be in a checked bag. I usually only do carry-on, but I fear those days are over. I'll take my medications, wallet and knitting on the plane with me and that will be about it. 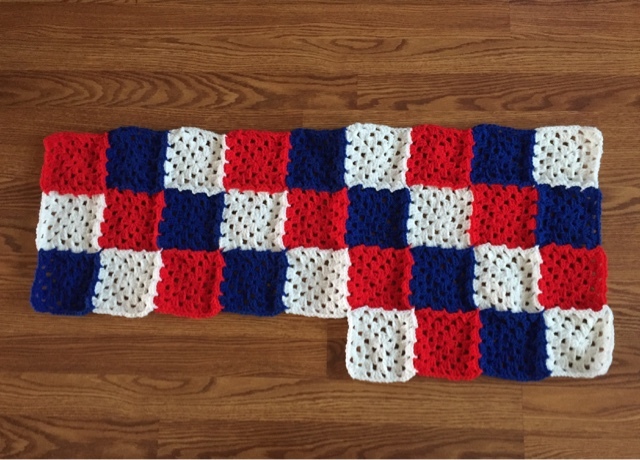 I have only worked on the blanket for the Veteran's Home for two evenings but it's coming along nicely. Each square is about 5 inches across. I may add more rows to the length if I have enough yarn. I think I'm gong to run out anyway and have to buy more and if that happens I will definitely make it longer. Are you ready for a happy picture after all of the "ick" I shared with you? 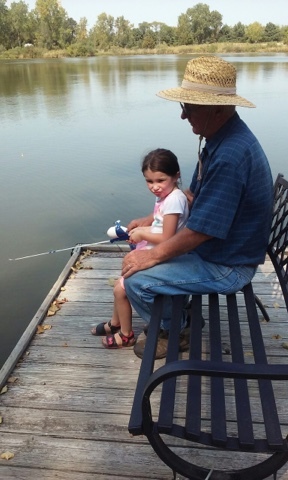 Here's Miss Piper enjoying a quiet moment fishing with her other Papa in Nebraska.. This little girl has a lot of people who love her. She informed me that she didn't catch anything but had fun anyway. I hope I didn't upset anyone with all of the "stuff" I shared. Sometimes life is like this. A series of not so great things. I think it's important to share the bad along with the good with your friends. And I DO feel that you are all my friends. The verse I would love to share with you today is one that Marilyn from the blog "Mountaintopspice.blogspot.com" shared this week. It's so appropriate and speaks to my heart today. I hope it brings you some peace too. I hope you all have a wonderful, much calmer week ahead and that you feel free turn to the One who can comfort us through anything we face. He's just waiting for us to ask Him. Betsy I just pooped on my blog for the first time in over a week and I saw your post first. My dear friend, we are hearing about your fires way over here in Florida. They are just as tragic as what has happened here. So much destruction, so many people affected by the weather, mother nature and very stupid young men that would take that incident back in a second if they could. 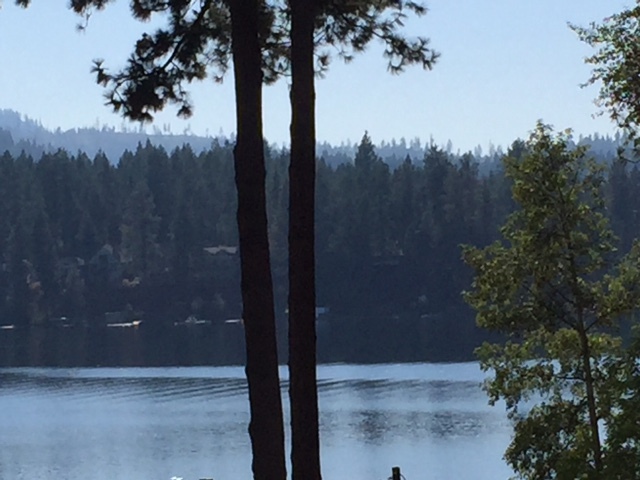 You have been on my mind as has Teresa and other blogging friends out there near the fires. I pray for rain, and I pray for that young man who caused such destruction without understanding the big picture of his actions. I love your knitting dear Betsy. It has been quite a week all over. Praying that YOU get some rain in the west. Praying that we DO NOT get rain here. Your projects all look great and you've been really productive. Have a very knitty week. Hugs to you, Betsy. There sure is a lot of difficult stuff going on everywhere right now. I loved seeing what you've been working on, and that photo of Piper is adorable. She really does have lots of love in her life. Oh, dear....these are hard times aren't they? The world is changing so quickly and sadly not for the better. I have no idea how the generation of love and peace spawned so much hate in the generations that came after. We all need to take a good look at ourselves and figure out what's going on. Pretty flowers and little girls fishing...we have to find solace in the little things. Oh Betsy that's just awful! There is just too much sadness happening in our world. We've had some clear skies here since Friday. But this afternoon at work I could see something like smoke but one customer said there were alot of farmers working in their fields lately. On my way home I could tell there was smoke from west to east in the sky. Not clouds. I-84 has been opened partially, in one direction. Sorry to hear of the incidents with teen boys dying. Never understood that and it happened here in town to a couple of our firefighters' sons! Sigh! Never saw it coming. 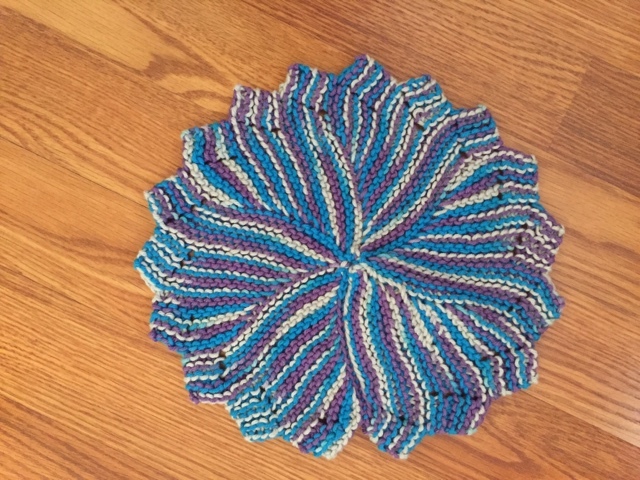 Fun knitting projects. I'm hoping to stop in town where memorial will be and visit a knitting store since I won't be going to Flock and Fiber fest. Sigh! Oh well. Thanks so much for your kind words and prayers. I am working through the loss! Have a good trip to NE and enjoy your sweet granddaughter! Hugs and love! You have been in my prayers along with all those affected by the fires. There is a lot of sadness about but like me you we do find solace in little things and our love for family. Miss Piper is certainly blessed to be surrounded with so much love. As always a joy to see your wonderful creations, there is nothing nicer than a handcrafted knitted/crochet wash cloth they are a delight. Sorry to hear about the tragic events. The flowers are beautiful and so are your projects. Good will prevail, and God is good. Your knitting projects look fantastic. 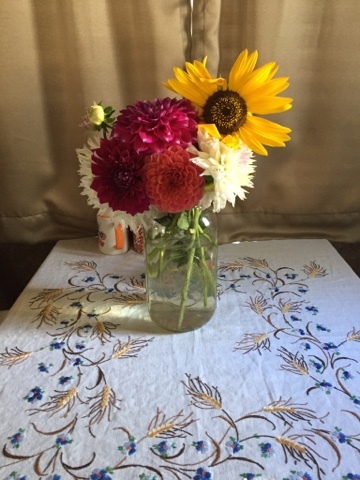 I love the flowers - dahlias and zinnias are beautiful. Oh Betsy. Im so sorry about the overwhelming news ...that just keeps coming. Piper is too sweet and a great reminder of all that is good, innocent and young. To say I love your cotton dishcloths is an understatement. I adore them. Im praying for Teresa and the family and that darling farmstead of hers. For now, I see hummingbirds still coming to my feeders in the woods, and I see the turkeys are back plucking at the ground. God has surely welcomed the suffering boy into his everlasting arms. Prayers for his loved ones. Amen and amen, dear Betsy a meaningful post. We need to look up to the beautiful Lord Jesus, looking up and not at the mud underneath.. Very sad re lives lost, for no gain, I'm glad we've stronger gun laws than the US. It's never happened in a school here to my knowledge that someone is shot and killed. Admittedly we are a smaller country but still none is a blessing indeed. Praying for journey mercies. I'm so glad you can travel. Yes, I take all of my medication, toothbrush, clean undies and socks are my standby. I've had luggage go astray. Teaches a lesson. ps amazed at your productivity making a dress in about 24hours!! Oh, my! So many tragedies! So very sad and so many hurting hearts. May God have mercy and bless each one who is suffering and grieving. SO sorry you are still having so much haze from the fires. It seems like this is being forgotten or overshadowed by so many other disasters...our world is in utter chaos. The verse Marilyn and you shared is one of my favorites...well, that whole chapter is a favorite. SO many promises made to us if we dwell in the secret place of the Most High. Many blessings to you, sweet friend! You brighten the corner where you are and pray for those you cannot touch. Your yarn creations will cheer up so many-keep doing what you can! Love that Piper picture and all your projects, too. We had some smoky haze today although not nearly as bad as yours. Let's hope the rain arrives on schedule and that the coming week will be a much better one. Hugs from here to you. Sorry I'm late getting to this post Betsy! The smoke and the haze here was just terrible, and it hurt to just be outside! So thankful that the rains we have been getting have put a stop to that! I imagine you are on your way to NE to visit with your precious family. So much tragedy around us, at times almost unbearable to hear any more. Thank you for mentioning the verse that has stood by me so many times. How blessed we are that in the midst of such suffering we can lean on the Lord for our strength. I know what you mean by praying and working away, I do that too. All your projects are lovely, the sweet little tablecoth adds a darling element of charm to your home! Oh, that Sweet Piper, so precious! Have a blessed visit, dear friend, and will look forward to hearing about your trip when you get home!